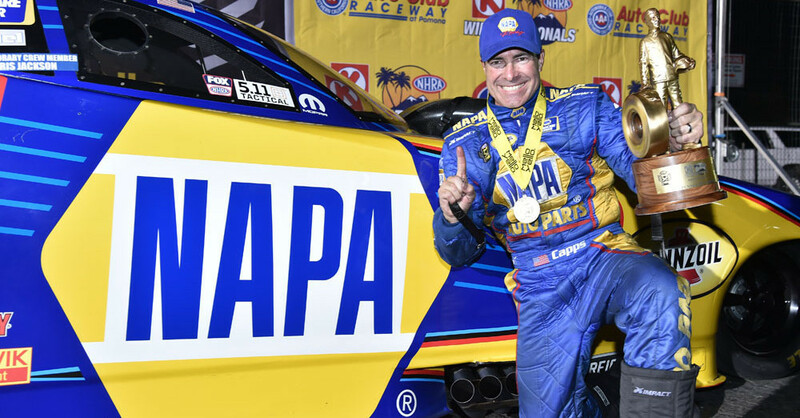 POMONA, Calif. (Feb. 14, 2016) – Ron Capps and the NAPA AUTO PARTS team with crew chief Rahn Tobler took center stage Sunday to start a new racing season and a new era with the Fox television network by winning the NHRA Circle K Winternationals in Southern California. 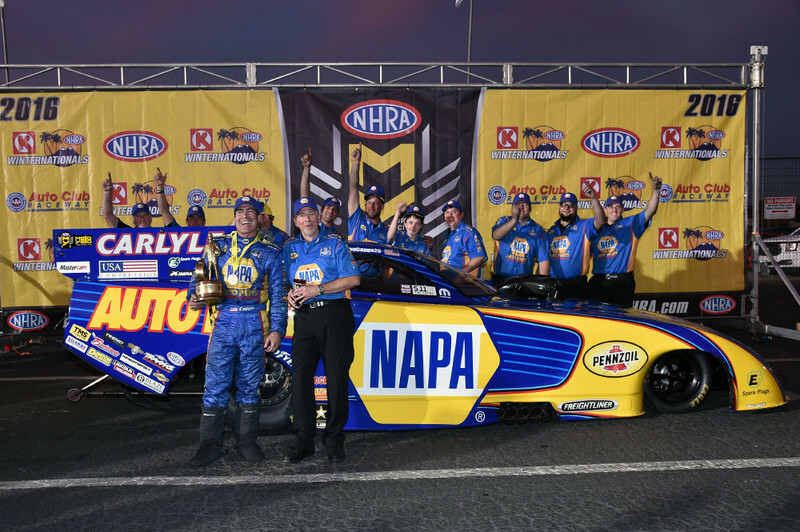 The 45th Funny Car title for Capps, who is the second winningest driver in the category, received a money-saving perk by winning the season-opener of the Mello Yello Drag Racing Series season. “Now I can give the Wally (trophy) to my wife for Valentine’s Day,” he said of Shelley, who attended with their children Taylor and Caden from their home in Carlsbad near San Diego. 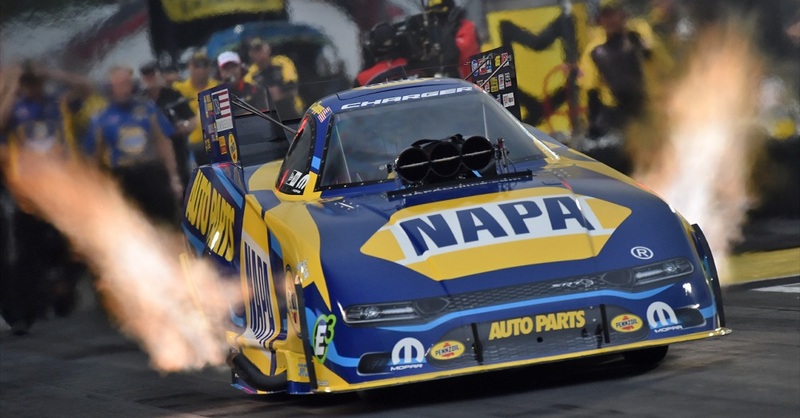 Capps and the NAPA team were dominant all weekend during the first of 24 NHRA national events with seven of his eight runs in the 3-second range including all four in qualifying that helped him earn the No. 2 spot. After beating Jeff Diehl and Chad Head in the first two rounds, Capps eliminated former world champion Robert Hight and then used a better reaction time at the start of the final round to top reigning world champion Del Worsham. Capps left the starting line first and finished the run in 3.981 seconds at 324.28 mph to overcome Worsham’s slightly better 3.978 (321.81). 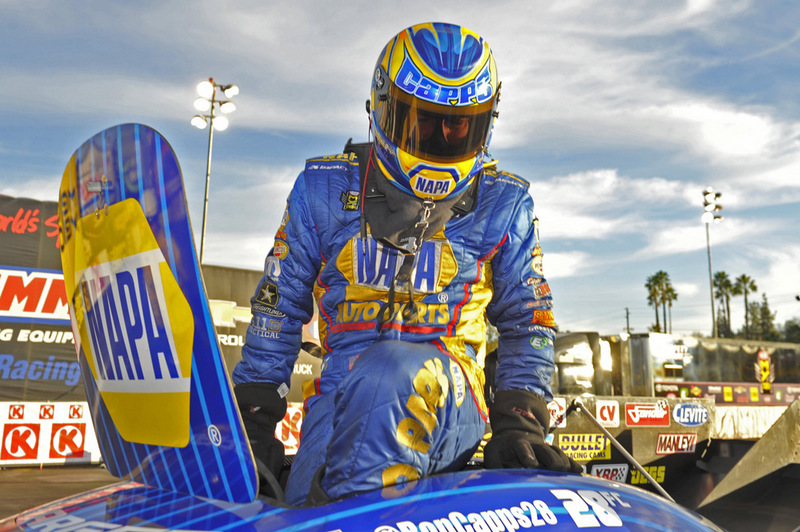 “I have the best team in the business and they gave me a great racecar,” Capps said. 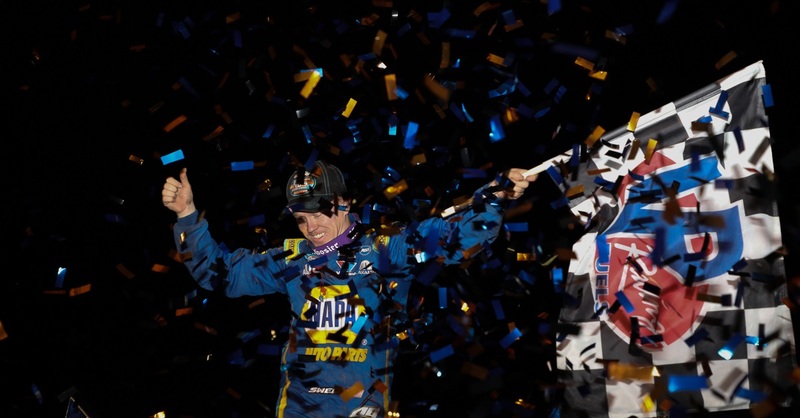 “There’s no holeshot win without having the car we did. All four runs in the 3’s in qualifying, I don’t think anyone else did that. I was quietly looking at that. I knew we had a good racecar. 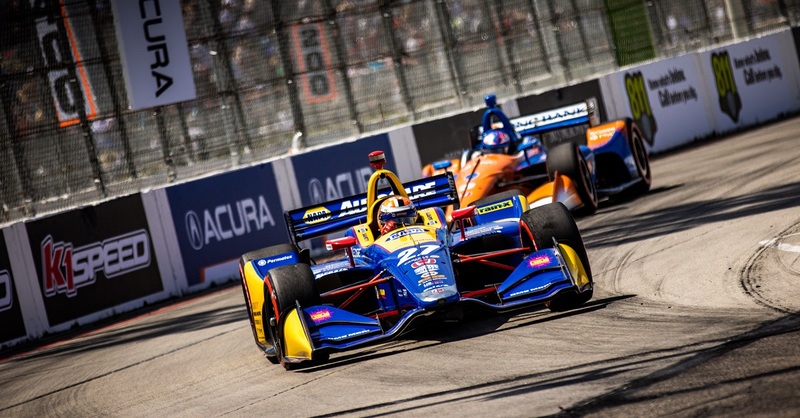 It was an even better day for NAPA AUTO PARTS when Chase Elliott, who is replacing Jeff Gordon in the No. 24 NASCAR Cup stock car, won the pole for the Daytona 500 in the first race in which his car is sponsored by NAPA AUTO PARTS. 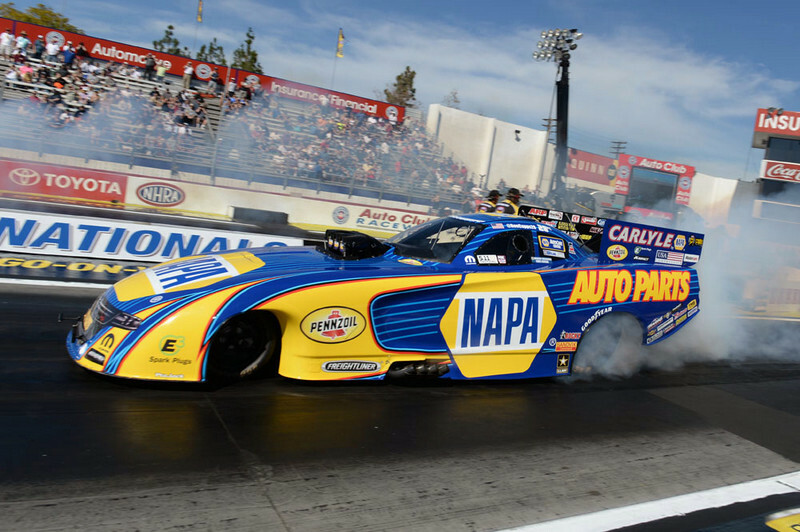 Capps is the second all-time winningest Funny Car driver and increased his win total to 45, and improved on last year’s performance at Pomona when he was runner-up to DSR teammate Matt Hagan. 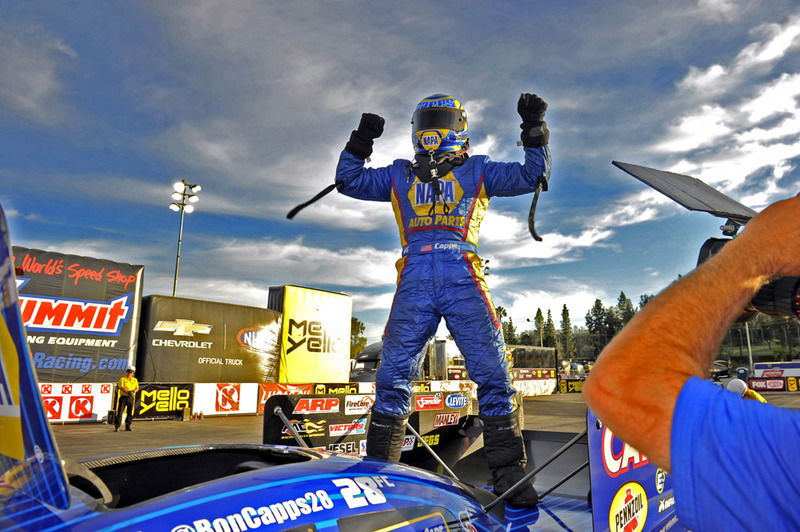 The win is Capps’ third at Pomona with all coming in the Winternationals. 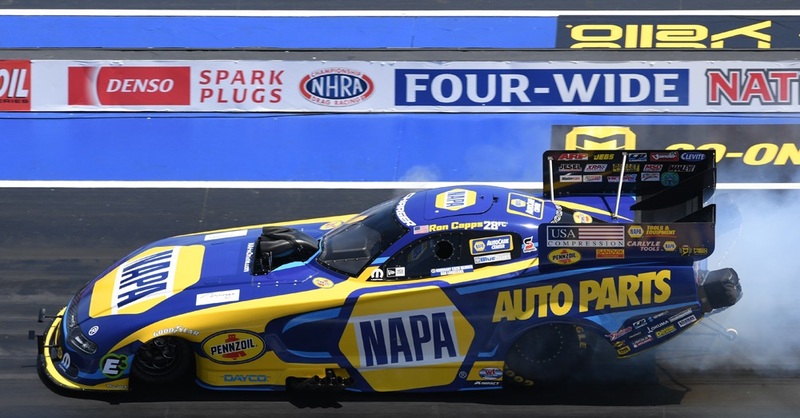 Capps will go down in NHRA history as the first Funny Car driver to be interviewed on live TV for winning the Winternationals, which is the first of 13 races that will air live on FS1 with four more being shown on the main Fox network as the new era begins with NHRA on Fox. 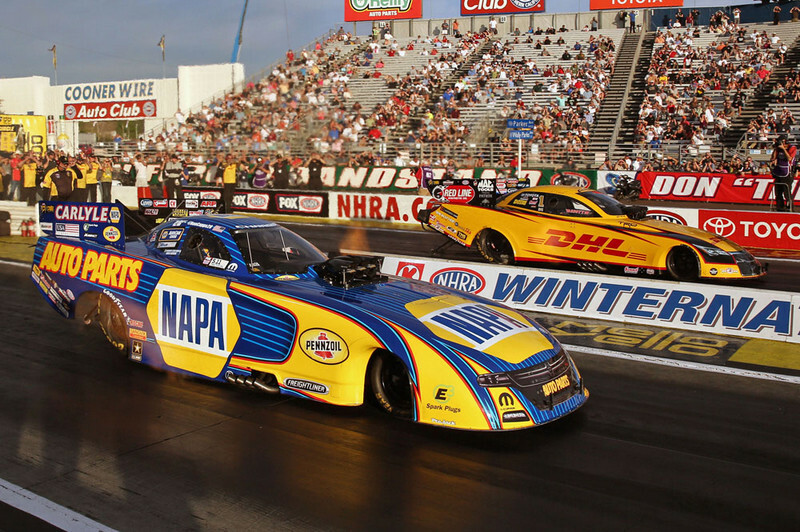 The Mello Yello series resumes in two weeks at Wild Horse Motorsports Park near Phoenix where Capps has won three times.